Strip 101 - 100th Strip - Part 2 - 5 Stars! Well, I think that's a good place to end Season 4! Bit short of a season, don't you think? Anywho, Season 5 will be out soon enough, Yayyyy! My plans are to have this season contain an overarching storyline, not sure how that'll go. 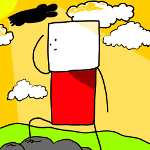 Super Toby will still have his adventures. Well, in the meantime, check out my blog! Cool. Congrats on 100 strips, a big achievement. Thanks for the laughs. Love the folded over banner in this one! Hehe. Thanks again.